As part of the ‘Coke Loyal Series’ project started by Coca-Cola Pakistan, emphasis is placed on those people who value the Company’s brand presence and are enthusiasts in the genuine spirit. The series aspires to share inspirational stories of individuals who have an extraordinary association with the Company’s brand some way or the other. The limelight today is on Natasha Shammul Khan, Director of Student Affairs at Cordoba School for A ‘levels in Karachi, Pakistan. Natasha’s association with the brand started in her early childhood, at age 5, brought on by her fascination with the color red. Her mother’s friend’s husband, at the time, employed with Coca-Cola in Hyderabad, Karachi, took note of her favorite color, and henceforth began bringing her various Coke mementos and souvenirs, such as stationery items, school bags, mugs and t-shirts to name a few. This led to her continuing to collect Coke paraphernalia over the years which still continues to this day. The Coca-Cola team visited Natasha’s apartment and immediately her immense bond with the brand is clear. The colors red and black are an overarching theme in her décor which includes aesthetic hand painted Coca-Cola themed lamps, a vibrant variety of branded coasters, and large colorful collector’s limited editions of different beverage bottles and cans. She also has beautiful Coke embroidered bathroom towels and various delightful knick-knacks around her kitchen and house. More interestingly, her passion for Coca-Cola is clear in her voice, and the pride that emanates from her face when she speaks about her passion for the brand is wonderful. 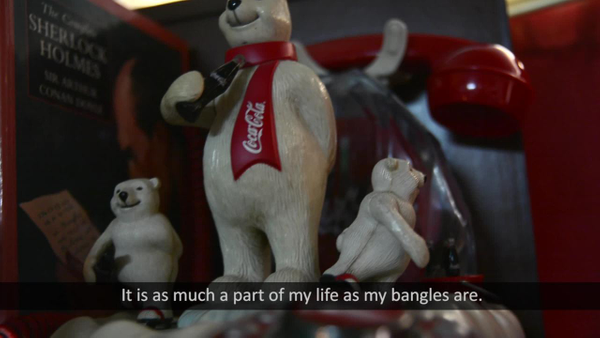 Natasha’s love for Coca-Cola is inspirational and we are proud to feature her in this installment of the Coke Loyal Series.